Gluten Free Goodies – Lime Meringue Pie. 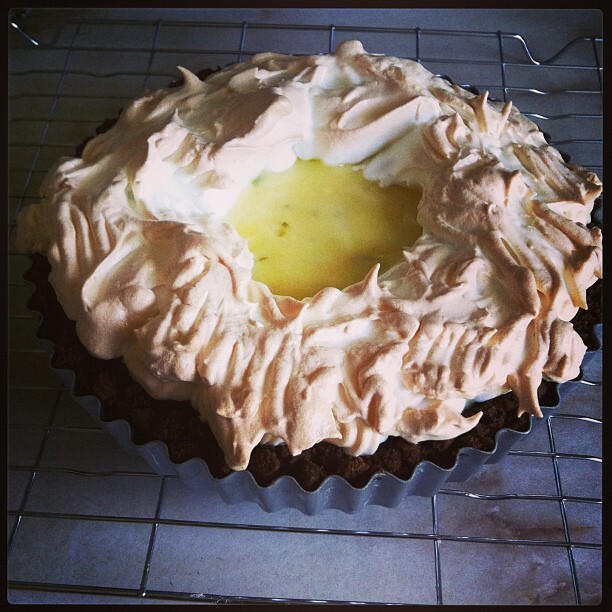 Over the weekend I baked a lime meringue pie and it was so good I have to blog about it! The recipe is from the ever growing collection of gluten free recipes on Domestic Sluttery. I had it bookmarked, when I saw Jo make it a couple of weeks ago I knew I needed to make it sooner rather than later. My grandad was with us for lunch on Sunday and he has as sweet a tooth as me so it seemed like a perfect time. Overall I was really happy with how it turned out. The recipe was very easy to follow and the end result looked and tasted good. The only problem I found was that the base was quite crumbly, the recipe uses Bourbon biscuits and no additional melted butter to bind it – apparently the cream centre of the biscuits should be sufficient. I don’t think it was, and when I next make it I’ll be adding some melted butter to make sure my base binds well. This recipe was of course written for a gluten free dessert, but there’s no reason why you couldn’t use regular biscuits in your base. Previous Post Recent Reads: Some Girls Are by Courtney Summers, Crossing the Line and Dare You To by Katie McGarry. Next Post Recent Reads: The Diviner’s Tale by Bradford Morrow and Temptation Island by Victoria Fox.